Facebook is a lot of things to a lot of people. It has the power to unite and to divide, to heal and to injure. It sounds ridiculous, no doubt, to non-users, but its effect on my life has been profound. But one of its most surprising and beneficial effects has been its impact on my prayer life. I would like to be one of those people who gets up half an hour early to pray, who has a home shrine, who walks in labyrinths and attends adoration weekly. I wish I could work up the energy to attend Mass more than once a week and find the time to go on a retreat. Maybe some day I will be one of those people. Still, one thing I do try to do, every single day, is pray for other people. But you know how it kind of becomes a reflex to tell someone you will pray for them, and you say a prayer then, but later you more or less forget about it? I always did that, and I felt bad about it. As I said my nightly prayers I would find myself saying something like, “For all those people I said I would pray for.” I know God can sort it all out, but I still felt guilty and thoughtless. But the thing about Facebook is that you see daily the friend or acquaintance for whom you have promised to pray. Not only has my circle of friends widened thanks to Facebook, so that I have more friends to pray for, and more of THEIR friends to pray for when they ask me to, but I see regular updates which remind me to keep that person’s intention in my prayers. And I feel myself drawing closer in spirit to the people I am praying for. After what we went through last year, I KNOW the power of prayer to lift people up. But the benefits are not all on the receiver’s end. I find myself feeling almost excited about saying my nightly prayers now, as I make an effort to go through and think about each person I have promised to pray for, and ask God for the special blessings each one needs. If I fall asleep before I finish–it does happen–I don’t just feel guilty, I feel disappointed. I never really thought of prayer as something to enjoy before, and now I do. What's a Catholic Voter to Do? I love this Leslie- you are the first person I’ve seen to address a rapidly growing social media phenomena. Oh, thank you so much, Maggie! It has certainly been a welcome thought unforeseen consequence of my social media mania! I love this. I also have felt badly about letting the prayers slip through the cracks and become forgotten. I fall asleep praying sometimes,I prefer to think of it as God has given me peace about what I’m praying about and is telling me to rest and all will be taken care of. I can get on board with that interpretation. 🙂 Thanks, Mary. I agree with you Leslie. I believe that my prayer life & spiritual walk has grown by leaps & bounds because of Facebook & my contact with family & friends that I could not have otherwise been close to! What a spiritual blessing! Thank you, Kathy. Isn’t it neat? Ah, Leslie, I do the exact same thing — feel disappointed if I wake up at 5 am and realize I didn’t finish my bedtime prayer! 🙂 This entry is so true. I do find myself praying more frequently and GENUINELY for my friends than before — not that my prayers weren’t genuine before, but many times I would give the “Sure, I will pray for you,” requisite response and then give a quick shout out and go about my day. 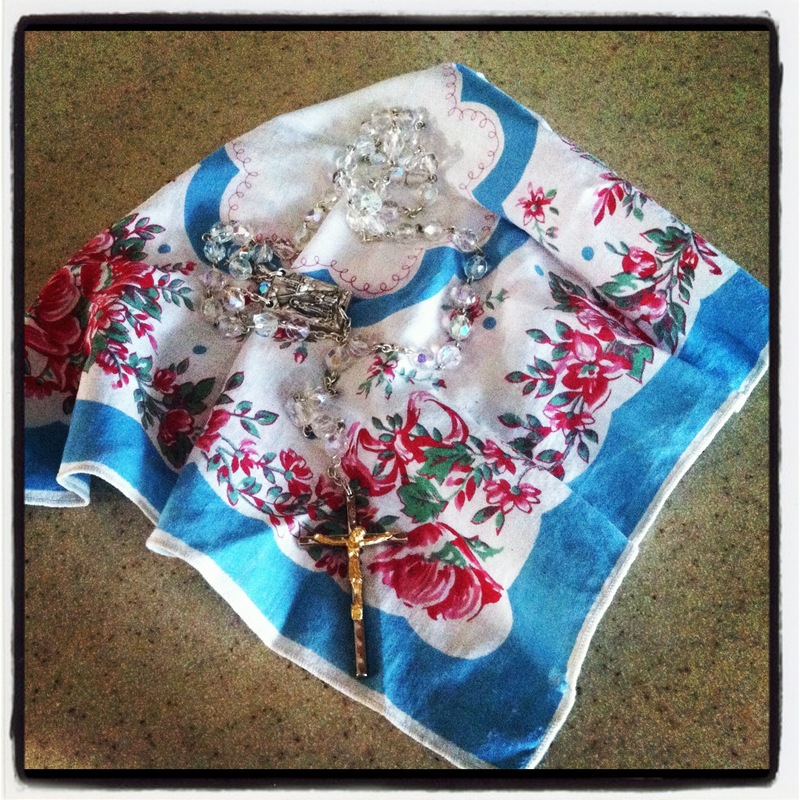 The picture of your rosary literally made me tear up. I used to take mine to bed with me each night and pray until I fell asleep. Though I no longer worship at a Catholic church, I still pray the rosary from time to time. I used to collect them because they brought me such peace. I think that is the rosary you brought me after the house burned down. 🙂 I know many people don’t understand how you can form genuine connections with people via computer but it’s certainly been true for me! I love that you are embracing social media and using it in a way to share your faith. As you know, your faith and words have lifted me up and touched my life and the interaction we had one day on Facebook helped to restore my faith which felt like it was slightly struggling. Like you, I believe so much in prayer and I pray everyday. I also do my best to pray the rosary although sometimes I fall asleep and only get through a decade. I love that you wrote about this. Thank *you*, Caroline, for lifting my spirits today and every day! Your responses are always so heartfelt and raise my spirits. I hope you know that. This isn’t such a good, and timely, reminder of how to take something like social media and use it to enhance prayer. Thank you for this reminder! I dubbed this ‘praying my newsfeed; – maybe it justifies more time on Social Media… lol but at least I know I am doing some good with it! GREAT article! Yes. I believe in the power or prayer. Especially when someone is having a difficult time, no matter the reason. I say a daily Novena with the help of the St. Therese site. I love that in between doing my Facebook work I can also say prayers. I must admit that my prayer time has decreased since the internet but this is a good reminder! Leslie, I love this post! I use to feel guilty too when I would tell people I would pray for them and would forget at night. What I started to do is when people ask for prayers now via social media I stop what I’m doing and say a prayer for them. I’m usually sitting at my desk which makes it easier for me to do this. I like to ask for the first name of the person I’m praying for too. This is so beautiful! I love the idea of praying purposefully for those people you come in contact with through social media.